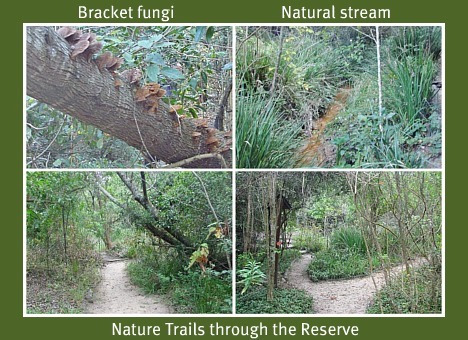 For the elderly, single visitors or even couples, Pledge Nature Reserve, Knysna is an excellent way to get a feel for what an indigenous forest is like. Just off the N2 road through Knysna, you turn left at the robot at Grey Street going up the hill. Take the turning to your left at Bond Street and at the end of the road you will drive into the parking area of Pledge Nature Reserve. 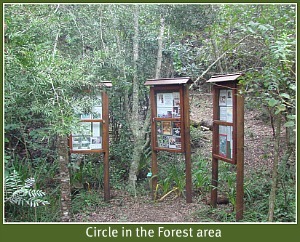 Knysna Tourism which is on the main road in the block before you get to Grey Street, also has a map showing Pledge Nature Reserve in its official Knysna brochure. The Reserve is open from sunrise to sunset every day and there is a booth where you can collect a brochure that gives you the best map and information about the park. Take some refreshments or a picnic lunch, your camera, some reference books and a pair of binoculars and you will be able to enjoy a beautiful day in a forest right in town! Yes, I know your backpack may weigh a ton but its worth it!!! NB: Pledge Nature Reserve was badly damaged by the 2017 wildfires and will take time to recover. 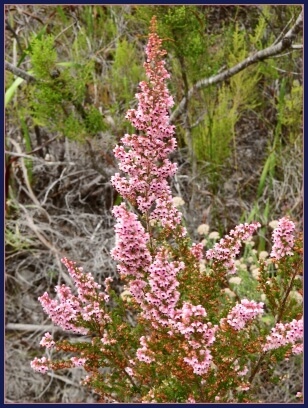 Sep 2018 - The reserve is open again and volunteers have been spending Wednesday mornings clearing and weeding out the aliens and replanting the indigenous plants so the Reserve is springing to life again with some wonderful new plants being noticed along the pathways. So pay Pledge Park a visit and even drop in on a Wednesday to help the volunteers - all willing hands are welcome. Bring water, hat, gloves and screwdriver! So far, 32 Wednesdays, 400 hours and approximately 120,000 alien invasive plants pulled during Weeding Wednesdays!! Join them at 9:30 to 10:30, meet at the lower entrance. We found the park some 25 years ago (early 90’s) whilst on one of our many holidays at our Wilderness Dunes timeshare. Pledge Nature Reserve was still in the early stages of its development. As we arrived we came across a woman in wellingtons and dungarees labouring away digging in garden beds with a spade. In conversation with her we discovered her to be one of the founder members of the reserve. 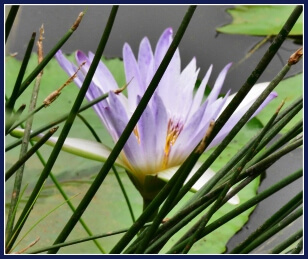 How Pledge Nature Reserve came about is an interesting story so let’s start at the beginning….. In its early days, Bok-se-Kloof as it was called, was a brickfield situated at the edge of town where a sufficient supply for the brickworks of raw materials and firewood could be found. 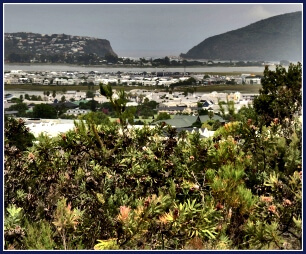 After it closed down some unrecorded time before 1920, a “Brownie movement” founded by Daisy Eberhard, a member of a Knysna pioneer family, got permission to use a portion of the area for her group. A section was cordoned off with 500 yards of fencing and under Daisy’s guidance, a few generations of local youth got to learn about the area’s diverse botanical splendour. As time went by, the town expanded, the stream silted up, and occasionally, the ground was affected by flash floods. This made it unsuitable for development so it became a dumping ground for builders’ rubble and an informal refuse dump. Inevitably it became overgrown with invader species. 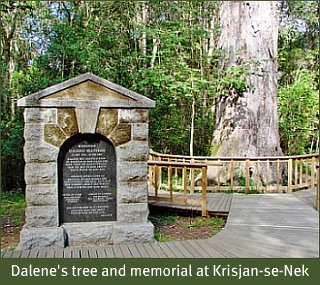 A local forest officer and town councillor, Kitto Erasmus suggested in 1988 that Bok-se-Kloof be taken on as an Arbor Day project to clear out the alien vegetation. 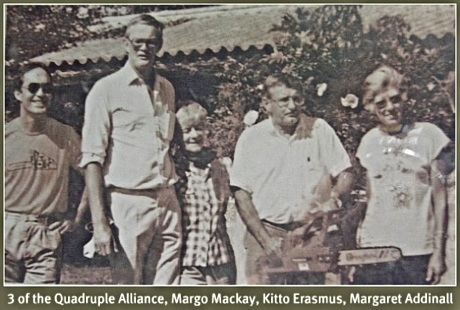 He advised Margo Mackay who had established a branch of the Wildlife Society in Knysna that there was a sponsorship available for a forest conservation project. 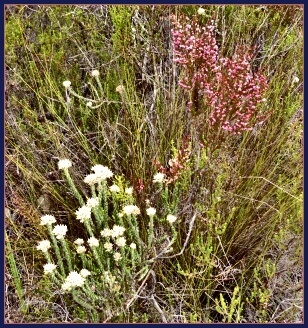 Margo enthusiastically agreed that the society adopt Bok-se-Kloof as an environmental rehabilitation assignment. Samuel Johnson of SC Johnson Wax, had a strong sense of environmental responsibility and was more than happy to sponsor the project with a generous grant. As their range included Pledge Furniture Care Products, it was agreed that the Reserve should be called Pledge Nature Reserve. The last member of the "Quadruple Alliance", was Margaret Addinall. Not long after being widowed, Margaret was diagnosed with Leukemia. 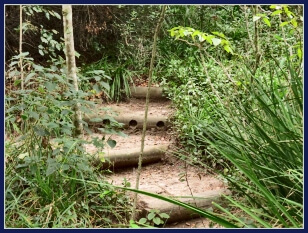 Walking out of hospital cured two and a half months after her diagnosis, it was as an act of gratitude that she became "hands-on” involved in the rehabilitation of the kloof. Margo Mackay had begun the work by organising groups of hacking parties to chop out exotic invader species. Vandalised buildings on the site were purchased by the Wildlife Society and then renovated to provide a store, office, toilets and a curator’s cottage. With support from local business and interested individuals that supplied materials, tools and equipment, Margaret Addinall and 6 workers began the massive task of clearing out the rest of the invader growth. On April 20, 1989 the Knysna Municipality approved the formation of the Pledge Nature Reserve Management Committee and Margaret was appointed the Reserve’s first curator. Kitto was the first Chairman. Members, Ian and Richard Topsaw also got personally involved and assisted with the hard work of using chainsaws to remove a number of the large alien trees. Margaret was labouring alongside her team when we met her that day, on our first visit to the reserve and because of our relentless questions she took a break to regale us with a few absorbing anecdotes. One was how she had asked the fire brigade several times to come and stand by so she could burn heaps of wattle that had been chopped out. They kept deferring until one day she resolutely set the piles alight to get the job done and they arrived in minutes as smoke billowed out over Knynsa. She also told us of her love of walking in the forest and that on one occasion as she approached a favourite resting spot she found another woman already sitting there. They sized each other up with a measure of hostility. Neither wanted to share their sacred space with another person but eventually they got talking and found out they were kindred souls. Margaret discovered that the woman she had taken umbrage to was none other than Dalene Matthee! 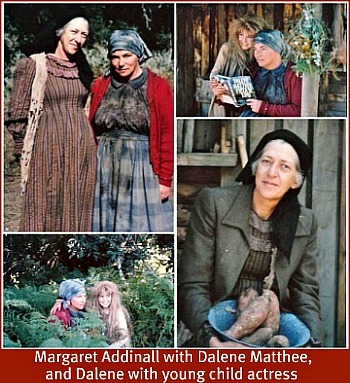 Margaret didn’t know then that she would end up starring in the film “Feila’s Child” made of Dalene Matthee’s book, “Fiela se Kind” directed by Katinka Heynes in 1988. The forest circles mentioned in another of Dalene’s books “Circles in a Forest” (Kringe in ‘n Bos) have been replicated in Pledge Nature Reserve. Kitto assisted Dalene with her research and her specialist technical and historical knowledge won her the Southern African Institute of Forestry Award. She was the first person outside of the forestry department to win this prestigious award. Besides many awards bestowed upon her for her contribution to South African literature, Dalene was also presented with "Stiftung fur Abendlandische Besinnung" an Annual Award for contributing significantly to the development of Western Culture. Clearing out the blocked up stream, creating paths and bridges, combating soil erosion, planting indigenous trees and shrubs took a lengthy period of time. But in 1991 enough had been achieved to enable the park to be declared an official nature reserve by Provincial Ordinance 726/91 in the Cape Province Gazette. The project also received MNet’s S.A. Nature Foundation Award that year and shared the R50,000 first prize with 3 other projects. There had been 4000 entries altogether competing for this prize. My family and I returned to the Nature Reserve a number of times on subsequent holiday visits as my late mother donated money for a tree to be planted in remembrance of her parents. It gave her a measure of consolation to be able to see a living memorial when she visited there as she could no longer visit her parents’ graves in Zimbabwe. After an absence of many years I visited Pledge Nature Reserve again recently (April 2011) on a Lakes Bird Club outing. It was wonderful to see how the Reserve has matured and the forest feels like a forest now albeit a relatively young one. It's tranquil and beautiful and pristine. The plants and trees are all numbered so that one can seriously take one's time and study them with a suitable book for that purpose thereby combining theoretical knowledge with practical experience. This helps us to realise how valuable this flora is to insects, birds, animals and not least of all, us! 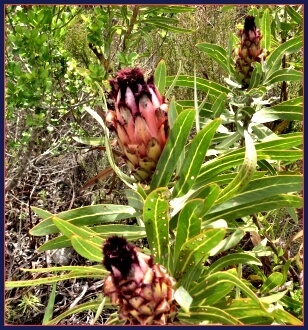 I climbed the steep slope on a trail called Memory Lane that took me along a path under the trees, until I reached a protea and fynbos area where I had magnificent views across the Knynsa Lagoon over Thesen Island and Leisure Isle to the Heads. It is a delight to see the many birds fluttering in the canopy of indigenous trees and the Cape Sugarbirds feasting on the proteas. 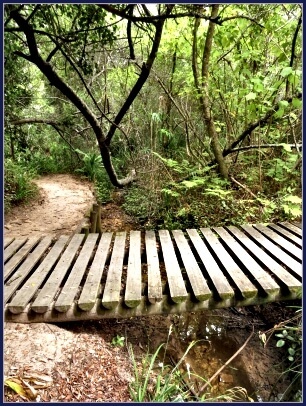 I returned to the lower parts and the wetlands of the Reserve on the Stinkwood Trail. 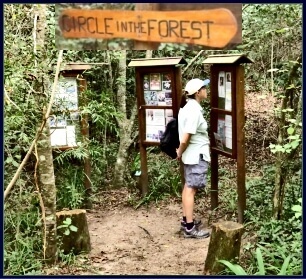 With the informative field guide and a colour-coded map of the trails, school children, locals and visitors - people of all ages - have a first class opportunity to learn a great deal about our indigenous forests and the Cape fynbos right there. Besides the many hundreds of trees, a good number of benches have been donated, so that there are many places for visitors to sit and relax and enjoy this peaceful haven. Sitting quietly on a bench can allow one to catch a glimpse of some of nature’s more secretive creatures like small buck, mongoose, porcupine and francolin that have been spotted on occasion. A natural stream flows down the valley and through Pledge Nature Reserve where it enters a small wetland area and a few ponds that enable it run into the lagoon in a fairly good and clean condition. 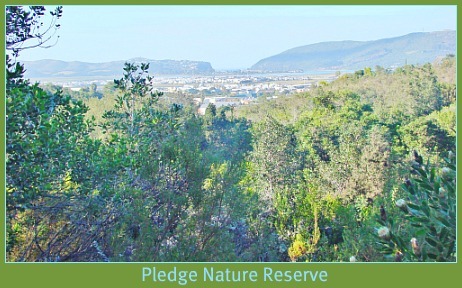 Leased on a long-term basis from Knysna Municipality to whom the land belongs, Pledge Nature Reserve Trust is the guardian of this community project. The small 10 hectare area was restored and is sustained by a relatively few dedicated individuals who have determined to give back something to this wonderful environment we call the Garden Route before it is lost forever. Their initiative has resulted in a pristine pocket of indigenous forest and fynbos in the heart of Knysna, a feat they can be justly proud of. 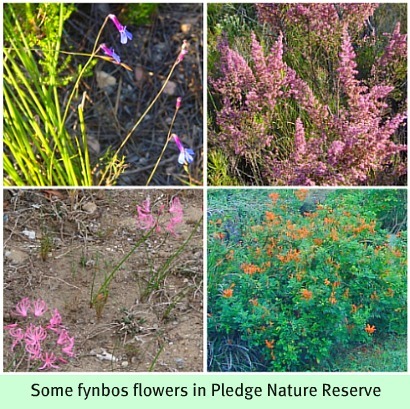 I know I will be visiting Pledge Nature Reserve more often and its a great place to take visitors who don't have much time to spare, so they can have an authentic experience of indigenous forest and fynbos . Every now and then, someone looks at the impact that ongoing commercial and urban development has on the environment and says "Enough's enough. Let's start putting something back before it's lost forever" The Pledge Nature Reserve is the result of such thinking. Dalene Matthee was born in Riversdale in the Southern Cape, South Africa, in 1938. She began her writing career with children's stories and short stories before taking on her first novel after a hiking trip through the Outeniqua hiking trail around Knysna. Her curiosity led to a journey through the stories and studies of these indigenous forests. In the end, she gathered enough material for four books, Circles in a Forest, Fiela's Child, The Mulberry Forest and Dreamforest. 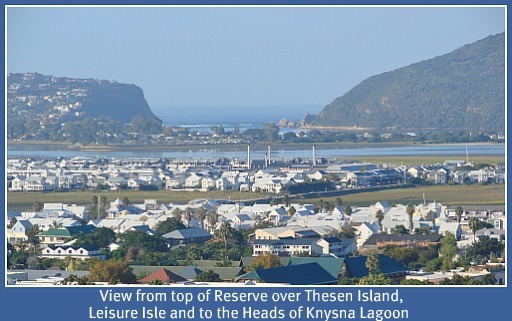 Steenbok Nature Reserve is a joint initiative by the Leisure Island Residents Association and the Knysna Municipality. Two areas Steenbok Nature Park and Kingfisher Creek have been combined to form one stretch of natural parkland. 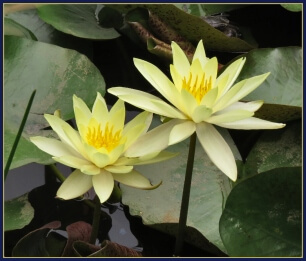 Lying on the northern shores of Leisure Isle in the beautiful town of Knysna, these small but precious areas of water-edged nature have a wealth of flora and fauna, and an abundance of tranquility.